“Easy scroll pagination” add-on allows customers to use easy scrolling while viewing the long list of products or website content. You can view how this add-on works on our site. Please, check the following pages Blog or Portfolio. Instead of standard pagination you can scroll down the whole list of blog articles or portfolio projects. Why choose "Easy scroll pagination"? Many customers are tired of clicking a page after page when searching for a necessary product or information. “Easy scroll pagination” add-on makes things much easier because customers can now comfortably scroll down a page to reveal more content. Since customers won't be tired of clicking a page after page, "Easy scroll pagination" add-on helps to reduce the bounce rate. With "Easy scroll pagination" there is more possibility that customers will be able to view all pages because the process of viewing is quicker. “Easy scroll pagination” add-on doesn't influence search results. Namely, Google indexes all URLs of your pages. The add-on works correctly in Internet Explorer, Mozilla Firefox, Safari, Google Chrome and Opera latest browser versions. 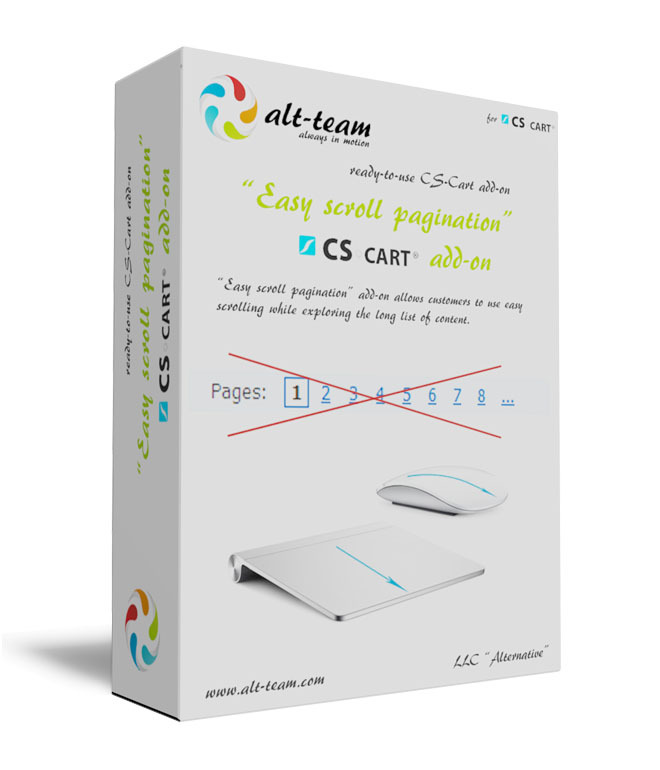 The add-on is compatible with CS-Cart and CS-Cart Multi-Vendor. 1. We offer free installation of this add-on only for the default CS-Cart versions (that don't have any serious file changes and additional modules). Otherwise, the installation may require an additional charge. Please remember that we can make any changes in this add-on due to your demands. Send a request. Add "View more" - click this checkbox and the "View more" link will appear below the first loaded page and then below the number of pages specified in the next setting (Number of first pages loaded for scroll). Don't click this checkbox and pages will be loaded one after another automatically while scrolling. Number of first pages loaded for scroll - type in the number of pages which will be loaded automatically once a customer clicks "View more' link. Show "Up" button on every page - click this checkbox and "Up" button (scroll back on top) will appear on every page of your CS-Cart website storefront. Don't click this checkbox and "Up" button will appear only on pages with a paginated content. 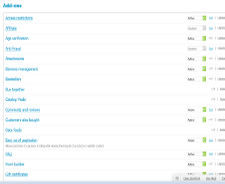 Category pages (This feature is available for CS-Cart v.4.4.x only). 2. In settings enable the Only chosen categories field by checking the box. 3. Then go to category pages where scrolling is demanded. On the category detail page, go to Add-ons tab. Place the check mark in the box that is related to Enable scroll pagination. 1. Download the archive with the Easy scroll pagination add-on. 3. Log into the administration panel of your store, go to the Administration -> Add-ons (CS-Cart 3) or Add-ons -> Manage add-ons (CS-Cart 4). 4. In the list of add-ons find the Easy scroll pagination add-on and click Install opposite to its name. 7. Read the Documentation to learn more about the add-on settings. "Great add on. Love it." "Hello Kevin! Demo for CS-Cart 4 is not ready yet. Sorry for the inconvenience. But the Easy scroll pagination add-on functionality is the same as shown on the available demo. All settings are described in the Documentation tab." "Any Demo Working On Cs cart Ver 4 ? Let Me check "
"Amazing product. Must buy for customer ease of shopping." "Thank you for so many great and needed addons for CS. I am going to have at least 3 of them." "Works great! Didn't even think about adding this to my site until I seen it was available. With over 6000 products, I have several categories that are several pages deep. This makes is seem like on big page. I did a couple other of tweaks to the website at about the same time as this one but sales have been great since so I'm sure this has helped." Thank you for your review. There was really a bug with pagination for categories but now this bug is fixed and we've sent a new download archieve for all "Easy scroll pagination" customers. Sorry for the inconvenience. " 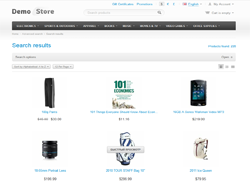 "While trying out the demo, easy scroll pagination performs perfectly. When I installed this software on my cs cart, when it made it to the bottom of any given category, it would keep trying to add more products through pagination even though there were no more. It could just be my setup or settings. I am using a highly modified cs cart 2.2.3. I have not asked for help yet and I probably should have allowed them to install this addon."